Download our detailed campaign pack which provides background information about Aafia Siddiqui’s case – from her early life to her disappearance through to her conviction – and detailing a number of ways in which you can participate in the campaign for her release. The pack includes model letter templates. Sunday 28 March 2010 is the 7th anniversary of the kidnapping of Aafia and her children. To commemorate this and to highlight Aafia’s case as symbolic of the brutality of the ‘war on terror’ with the aim of having her repatriated to Pakistan and launching an investigation into the whereabouts of her missing children, the Justice for Aafia Coalition (JFAC – www.justiceforaafia.org) has been formed – an umbrella organisation, currently spanning four continents, which aims to unite and direct all individuals and organisations concerned for our sister and working for her release. 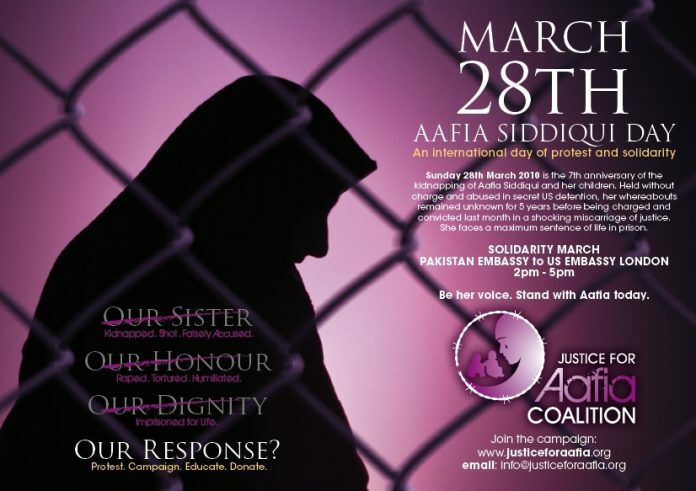 In an international day of protest, we aim to have events, demonstrations, letter-writing campaigns, khutbahs, etc in towns and cities all over the world in solidarity with Aafia on the one day – 28 March. Join us in our march from the Pakistani Embassy to the US Embassy London in solidarity with Aafia. 5 minutes walk from Knightsbridge. From station platform take Sloane Street exit and after passing ticket machines, take Exit #2 (Harvey Nichols). Follow directions marked with a green line on the following map. IHRC is an NGO in Special Consultative Status with the Economic and Social Council of the United Nations. Please help IHRC by visiting https://www.ihrc.org.uk/catalog and making a donation or buying an item from our on-line store. IHRC is not the author of the above alert, which has been provided solely on an informational basis. IHRC does not necessarily support the views of the author. IHRC is not responsible for the content of external websites, nor endorses them by providing their link. For more information, please contact the office on the numbers or email below.